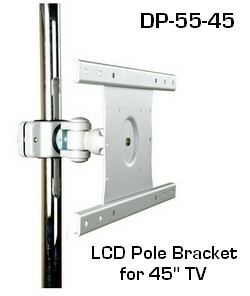 Easily attach a TV to a pole! - For TV monitors up to approx 45" width and 40 lbs. - Also compatible with different combinations of VESA widths 100; 200; 400 mm. and heights 100 and 200 mm. 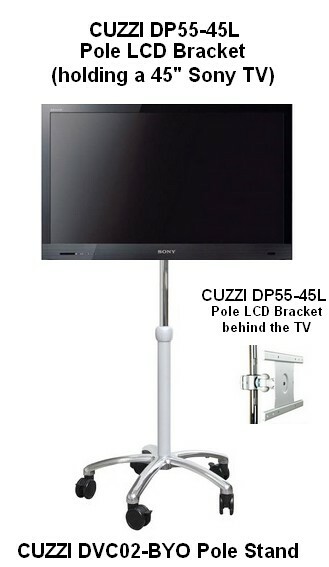 - Distance from rear of monitor to edge of pole: 5.5"
Below you can see the DP55-45L attached to our DVC02-BYO Pole Stand, a great way to roll your TV or LCD monitor from room to room.